Merriam Webster defines motivation as “the act or process of giving someone a reason for doing something” or “a force or influence that causes someone to act.” In psychological terms it is defined as “the process that initiates, guides, and maintains goal-oriented behavior.” It is what causes us to act and behave in ways that help us reach our goals. This involves the biological, emotional, social, and cognitive forces that activate behavior. But why do we need motivation? Why do we need someone to spark our fire to chase our goals and dreams? Shouldn’t we just innately want those things? Sure, but it is easy to get bogged down in the day to day humdrums of life. And there can be other factors that are out of our control that cause us to lose sight of our aspirations. Maybe you can’t find the job you want. Maybe you can’t find a job at all. It might be that you are having family problems or things aren’t going well in your personal life. In times like these, sometimes all it takes is a small act to get us back on track, but when you are already down in the dumps, it can be hard to find that spark within. That’s where motivational speakers can play a huge role in helping everyone reach their goals. A motivational speaker is someone who makes speeches that are intended to motivate and inspire their audience. They use their passion and own determination to help others find their own motivation. 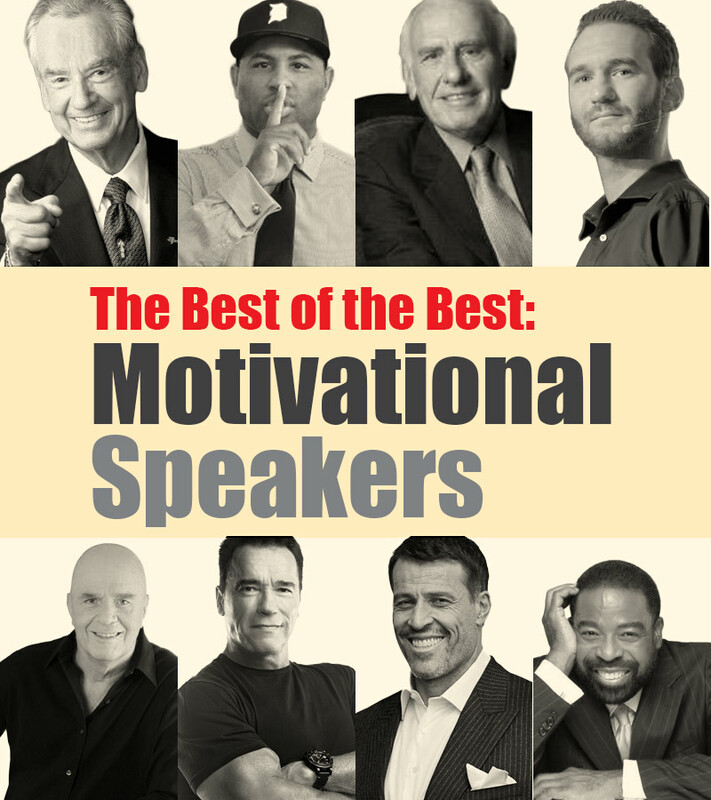 We’ve rounded up some of the absolute best motivational speakers that everyone should listen to at least once to help them become even more motivated to reach their goals. Leslie Calvin Brown was born in 1945, alongside twin brother Wesley, in an abandoned building in a low income section of Miami, Florida. He was later put up for adoption and found a permanent home with 38-year-old single women, Mamie Brown. As quoted in one of his speeches, he was declared “educable mentally retarded” in school when he was young. With the help of his mother and one of his high school teachers, Brown worked hard to get past this. And get past it he did. Today, he is one of the most famous and renowned motivational speakers on the planet. In additional to being a motivational speaker, he might be best known for his political career as a former member of the Ohio House of Representatives. He is also a popular business resource that has counseled people from Fortune 500 companies. But his motivational speaking is where he really stands out. His speeches focus on how important it is that you believe in yourself. “Don’t let someone else’s opinion of you become your reality.” He also speaks on how people don’t set the bar high enough for themselves and how important it is to dream big. “Most people fail in life not because they aim too high and miss, but because they aim too low and hit.” This real life story of someone achieving so much when it seemed impossible for him to do so has gained him a passionate and loyal fan following. John, or Jim, Rohn was a very successful and influential motivational speaker and author. His rags to riches story was one that helped people connect to him and his personal development message. He started out his career being a salesman, but, after being mentored by some of the company’s founders, he built one of the largest organizations in the company. He went on to become Vice President before the company went out of business in the early 1960s. He was then invited to speak at his Rotary club, and he then started speaking more and more all over the country. He spoke of his own personal story and on his personal development philosophy. “If you are not willing to risk the unusual, you will have to settle for the ordinary.” In addition, he also mentored several other influential speakers and authors, such as Mark Hughes, Tony Robbins and Jack Canfield, of the Chicken Soup book series.